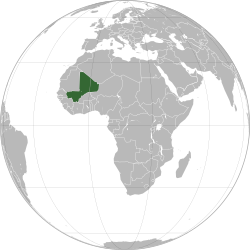 As the Sudanese Republic, with Senegal as the Mali Federation. ↑ "Mali preliminary 2009 census". Institut National de la Statistique. ओरिजनल से 18 April 2010 के पुरालेखित. पहुँचतिथी 12 January 2010. ↑ 2.0 2.1 2.2 2.3 "Mali". International Monetary Fund. पहुँचतिथी 20 April 2012. ↑ "Gini Index". बिस्व बैंक. पहुँचतिथी 2 मार्च 2011. ↑ "2016 Human Development Report" (PDF). United Nations Development Programme. 2016. पहुँचतिथी 21 मार्च 2017. ↑ Which side of the road do they drive on? Brian Lucas. August 2005. Retrieved 28 January 2009.